The bio-economy can be defined as the economic activity associated with the invention, development, production, and use of products and processes that are based primarily on biological resources. The bio-economy includes the use of resources from agriculture, forestry, fishery-based biomass, and organic waste. The field is multidisciplinary in that it cuts across health, energy, agriculture, chemicals, and materials industries. Similarly, biotechnology involves the comingling of basic sciences (such as biochemistry, molecular biology, genetics, immunology, microbiology, pharmacology, fermentation, and agriculture) with various engineering fields related to biotechnology applications. As such biotechnology innovation is a classic example of this sector’s contribution to the Canadian knowledge based economy. 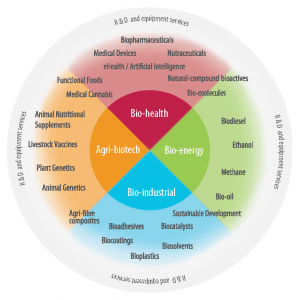 For the purposes of its own activities and mandate, BioTalent Canada defines Canada’s bio-economy as largely divided into four subsectors Bio-health, Bio-energy, Bio-industrial and Agri-biotech as seen in the following chart. The inner ring of the chart houses the four main bio-economy subsectors. The middle ring lists examples of activities or industries that may fall into the scope of each subsector, some of which may fall into the scope of two different subsectors and recent additions of medical cannabis, eHealth / Artificial Intelligence and sustainable development. The outer ring illustrates that all sectors can (and typically do) operate with an element of research and development (R&D), and equipment services. For more details and facts about Canada’s bio-economy see BioTalent Canada’s labour market information reports.